A new paper about the Coptic Dictionary Online will be presented at this year’s ACL SIGHUM workshop on Language Technology for Cultural Heritage. This work is a collaboration between the Akademie der Wissenschaften zu Göttingen, Berlin-Brandenburgische Akademie der Wissenschaften, and Coptic Scriptorium. 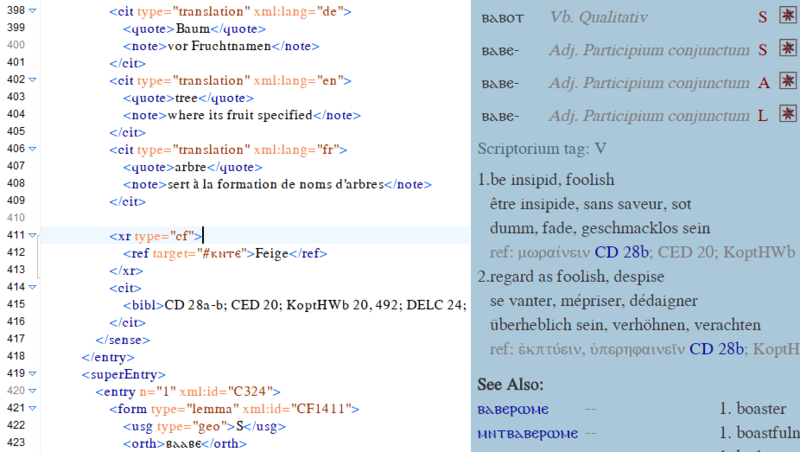 Feder, Frank, Kupreyev, Maxim, Manning, Emma, Schroeder, Caroline T. and Zeldes, Amir (2018) “A Linked Coptic Dictionary Online”. Proceedings of LaTeCH 2018 – The 11th SIGHUM Workshop at COLING2018. Santa Fe, NM.